Haneda Airport is nearest and most convenient airport to/from central Tokyo. Haneda Airport has three terminals. Domestic terminals, 1 and 2, are connected by an underground walkway. Keikyu Line has one station between terminal 1 and 2. Tokyo Monorail has two stations, one at each terminal. A free shuttle bus runs between each terminals every 5-6 minutes. 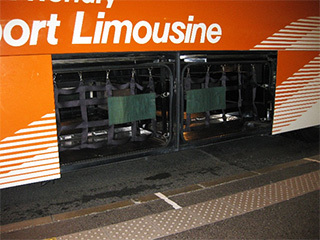 All shuttle buses feature low-floors for easier boarding. The bus driver will set the ramp for wheelchair user to get on/off the bus. Maximum 2 - 3 wheelchairs are able to ride on one unit. Transit between International and Domestic Terminals will take approximately 3 to 7 minutes. International Terminal: Shuttle bus stops at Bus Stop No.0 on the 1st floor of the passenger terminal. Domestic Terminal 1: Shuttle bus stops at Bus Stop No.8 on the 1st floor of the passenger terminal. Domestic Terminal 2: Shuttle bus stops at Bus Stop No.9 on the 1st floor of the passenger terminal. Aisle wheelchairs for transferring to/from the seats on the aircraft are available at the Information Counter and airline check-in counters. Aisle wheelchairs are designed to fit the aisle of an aircraft and are not suitable for long periods of static seating. Ask the airline check-in counters for using your own wheelchair up to the boarding point of the aircraft. Extra wide wheelchairs (seat size 63cm x 45cm) and reclining wheelchairs are also available. Within all Terminals, rental wheelchairs can be delivered to any place you have requested (e.g., train station or parking area). International Terminal: call from Information Phones (connected to call center, open 24 hours a day) located in the terminal. To request in advance, call 03-6428-0888 (Help Desk). Domestic Terminals: call 03-5757-8111 (General Information, open 5:00～25：00 everyday) in advance. A pick-up service using passenger carts is available at the departure and arrival international concourses. Call in advance (Help Desk 03-6428-0888) , FAX 03-6428-0889 to make a request. Wheelchair accessible restrooms (called Multi-functional restrooms equipped with ostomate facility) are provided on each floor of all Terminals. Service Animal Relief Area (SARA) is located on 1st floor. Ask the Information Counter for using the facility. All airlines require an advance notice to provide safe and accessible transportation for all passengers with disability. Special assistance policies differ in each airline. Contact the airline after you have completed your booking. Notes that some of the LCC (Low Cost Carrier/Low Cost Airline) airlines do not accept passengers with specific requirements, including wheelchair user, unless a care assistant or a companion is travelling with the passenger. Contact the airline before your booking. ”Haneda Airport International Terminal”, “Haneda Airport Terminal 1”, “Haneda Terminal 2”, are the stations to reach Haneda Airport. Approximately 15 - 20 minutes from Haneda Airport to Monorail Hamamatsucho Station. Takes another 10 minutes to Tokyo Station (need transfer to JR Line at Hamamatsucho Station). Haneda Airport Terminals and Monorail Hamamatsucho station are equipped with boarding ramps and elevator. Monorail units are accessible for wheelchairs. Maximum 2 - 3 wheelchairs are able to ride on one unit. Passengers with mobility scooters or other large size battery-powered wheelchairs may not be able to board the monorail. Ask Tokyo Monorail Customer Service for details. ”Haneda Airport International Terminal” and “Haneda Airport Domestic Terminal” are the stations to reach Haneda Airport. Approximately 15 minutes from Haneda Airport to Shinagawa Station. Takes another 15 minutes to Tokyo Station (need transfer to JR Line at Shinagawa Station). Train units are accessible for wheelchairs. Ask station staff for boarding support. Airport Limousine is NOT low-floor bus, however, the bus driver and staff will carry you up/down the stairs by request. Wheelchairs will be loaded into the cargo space with other passenger’s baggage. Collapsible wheelchairs and other assistive devices which can be collapsed to fit into the cargo space are allowed to load. Fixed rate taxis equipped with foreign language communication cards are available at Haneda Airport. *English available, open 24 hours, every day. Expressway tolls are not included in the fixed fare and need to be paid as a surcharge. 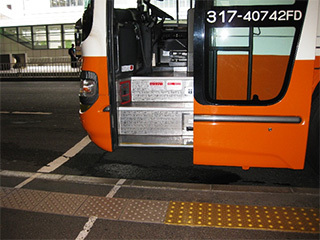 Taxis equipped with wheelchair accessible ramps and/or lifts are available at Haneda Airport. Fares and rates are different from ordinary taxis. Ask “Taxi Contact Information” above for details. 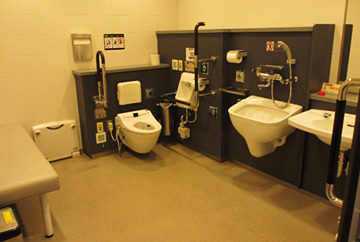 Information for passengers with disabilities is available on Narita Airport website (English). The following information provides additional tips about the airport facilities and services. Contact Narita International Airport Information 0476-34-8000 for furthermore. Wheelchair accessible restrooms (called Multi-functional restrooms equipped with ostomate facility) are located on each floor of all Terminals. Service Animal Relief Area (SARA) is located inside the international departure procedures. Ask the Information Counter for using the facility. Prayer Rooms are available for all travelers at each Terminals. Narita Airport has three terminals, Terminal 1, 2, and 3. Your terminal at the airport will depend on which airline you will use. Check the Narita International Airport Terminal Guidance in advance or confirm the location of your flight with your airline. There are North Satellite (North Wing) and South Satellite (South Wing) in Terminal 1. International arrival lobby is on the 1st floor. International Departure lobby is on the 4th floor. Airport Information Counter is located on each Wing. Tourist Information for foreign travelers is located on 1st floor in between North and South Wing. Duty free and shopping area is on 3rd - 5th floors, restaurants are on 4th and 5th floors. Starbucks Coffee, convenience stores, and drug stores are also available. Narita Airport Station is located on B1 floor. JR Narita Express, Keisei Line, and Narita Skyliner are available at this station. JR EAST Travel Service Center is located on the same floor, which provides useful information and services for foreign travelers (service available in English). There are Main building and Satellite in Terminal 2 building. International arrival lobby is on the 1st floor. International Departure lobby is on the 3rd floor. Airport Information Counter and Tourist Information for foreign travelers are located on 1st floor of the Main building. Duty free and shopping area is on 3rd floor, restaurants are on 4th floor. Capsule Hotel, convenience stores, and dayrooms are also available. Airport Terminal 2 Station is located on B1 floor. JR Narita Express, Keisei Line, and Narita Skyliner are available at this station. JR EAST Travel Service Center is located on the same floor, which provides useful information and services for foreign travelers (service available in English). Terminal 3 is “easy low-cost terminal” for LCC (Low Cost Carrier/Low Cost Airline) airlines. International arrival lobby is on the 2st floor. International Departure lobby is on the 3rd floor. Airport Information Counter is located on 2st floor of the Main building. Duty free and shopping area is on 3rd floor, food court is on 2th floor. Wheelchair accessible restrooms (called Multi-functional restrooms equipped with ostomate facility) in this terminal might be cramped with large size wheelchair. The entire building is accessible for wheelchairs, although the soft type rubber flooring is not suitable for manual wheelchairs. There is NO train station and NO parking area at this terminal. All passengers arriving at/departing from Terminal 3 must walk or use free shuttle bus from Terminal 2 (except for using city buses and taxis). See the following website for more information. A free shuttle bus runs between each terminals. Terminal 1 : Shuttle bus stops at Bus Stop No.6 on the 1st floor. Terminal 2 : Shuttle bus stops at Bus Stop No.8, 18, 24 on the 1st floor. Bus Stop No.8: To Terminal 1. Bus Stop No.18: To Terminal 3 via Terminal1. Bus Stop No.24: To Terminal 3. *See the airport website for operating hours. 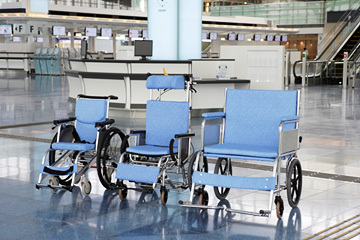 Aisle wheelchairs for transferring to/from the seats on the aircraft are available at airline check-in counters. ”Narita Airport Station” and “Airport Terminal 2 Station” are the stations to reach Narita Airport. ”Narita Airport Station” is connected to Terminal 1. “Airport Terminal 2 Station” is connected to Terminal 2. Approximately 53 minutes to/from Tokyo Station. 70 minutes to/from Shibuya Station. Narita Express also stops at Shinagawa, Shinjuku, Ikebukuro, Yokohama, and Omiya Stations. Accessible seats* for wheelchairs are available (2 seats on a train). *Need seat reservation in advance. Since the aisle is very narrow, it might be difficult for other passengers to go through when two wheelchair users are on the same train. Wheelchair accessible restroom (called Multi-functional restrooms equipped with ostomate facility) is available. Passengers with mobility scooters or other large size battery-powered wheelchairs may not be able to board the train. Check the policy statement for mobility scooters in advance. No food services/sales on Narita Express. Train tickets and seat reservations are available at “JR EAST Travel Service Center” on B1 floor, and “Rail and Bus Ticket Counter” located on Terminal 1 and 2. “JR EAST Travel Service Center” is recommended for reserving wheelchair accessible seats. High-speed wireless data transmission service, UQ WiMAX, is provided on Narita Express. It is NOT free wi-fi. Need to apply in advance to use the service. Approximately 40 minutes to/from Ueno Station. Takes another 10 minutes to Tokyo Station (need transfer to JR Line at Ueno Station). Accessible seats* for wheelchairs are available. *Need seat reservation in advance. Accessible seats for wheelchairs on Keisei Skyliner are wide and comfortable for large size wheelchairs. No food services/sales on Keisei Skyliner. Train tickets and seat reservations are available at “Skyliner ticket sales counter” on B1 floor, and “Rail and Bus Ticket Counter” located on Terminal 1 and 2. Reservation for wheelchair accessible seats is available only at “Skyliner ticket sales counter”. Free wifi service for international visitors is provided on Keisei Skyliner. ID and password are required to use the service. See the following website for details. UQ Wi-Fi, is also available. It is NOT free wi-fi. Need to apply in advance to use the service. There are many bus routes to/from Narita Airport. See the following website for details. Bus tickets are available at each bus stop, and “Rail and Bus Ticket Counter” located on Terminal 1 and 2. Fixed rate taxis are available at Narita Airport. Fixed rate taxis are also available without reservation at airport taxi stand. Taxis equipped with wheelchair accessible ramps and/or lifts are available at Narita Airport. Advance reservation necessary. Request must be made by E-mail at least 15 days before the booking date. Fares and rates are different from ordinary taxis. Contact T-Nacts by E-mail for details. Traveling with your wheelchair on a public transportation is a cooperative event. Especially in central Tokyo area, you may veer into a heavy crowd. It is wise and safe decision to ask for staff assistance to avoid any unexpected trouble. Have limited mobility or other disability to get on/off a train. Most of the train/subway stations are NOT equipped with fixed boarding ramps for wheelchairs. (Some platforms are accessible with no gap between train units.) A collapsible ramp is stored in the cabinet and operated by train staff. Have sight impairment and need guide within the station.Ask train staff posted at the ticket gate for assistance listed above. Staff assistance is free of charge. Notes that train staff are unable to provide personal assistance with feeding, toileting and other personal matter. Public transportation is now far more accessible than they were in the past, however, elevator and other equipments are still limited in location and that often cause difficulty for wheelchair users. Give yourself an extra time when traveling on a public transportation. Passengers with mobility scooters or other large size battery-powered wheelchairs may not be able to board the train. Check the policy statement for mobility scooters before arriving at Tokyo. Guidebook for IC card is available at Airport Information and train stations. IC card can be obtained from ticket offices or ticket vending machines at stations. A security deposit (500 yen) needed in order to obtain IC card. Charge the card in advance using the ticket vending machines at stations. IC card is rechargeable. The maximum charge amount is 20,000 yen. You must touch in and touch out with your IC card at the start and end of your journey. The fare for your journey will be automatically deducted from the card when you touch out. Deposit and balance of a card will be refunded when the card is returned to a ticket office. *220 yen will be deducted from the refund of the deposit. IC card listed above may be used outside of central Tokyo area. IC card is NOT valid for Airport Limousine, Highway Bus, Shinkansen (super express/bullet train) and other limited express with seat reservation. You can buy disposable single-ride tickets from every ticket vending machine. Fares are calculated with a distance-based formula. Check the price finder on the wall before you buy your ticket. Discount for children 1-12 years old is available. Single-ride tickets, round-trip tickets, one-day tickets, book tickets, and limited express tickets are available from vending machines. Ticket vending machines accepts Japanese yen only. 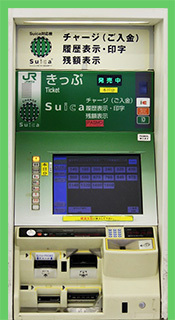 The display language may be changed to English.Automatic ticket gates. Insert your ticket into the slot on the right hand side of an automatic ticket gate. Ticket will be returned through the slot at the top of the gate. DO NOT forget to pick up your ticket. Keep your ticket until you finish your journey. A wide gate accessible for wheelchairs is normally located either at the end. Ask gateline staff if you need help or support.